Christ Episcopal Church is transitioning to a new Domain Name. Find us at http://www.ceclax.org and reset your bookmarks! Please note our new email address! 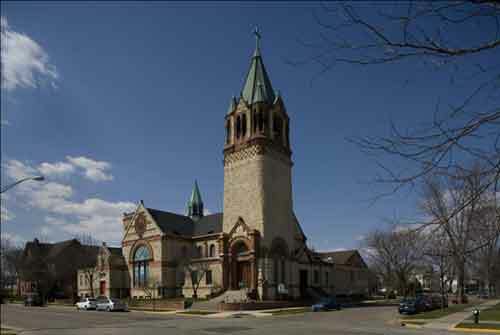 Christ Church is the oldest continually operating church in La Crosse. Our first service was conducted on Granddad bluff in 1850. Members met in homes for the first few years until a church could be built. The congregation quickly outgrew that facility so it was demolished with plans to build a new larger church which could be named the new Cathedral for the emerging Diocese of Eau Claire. The original architect died before the building was complete. His daughter was one of a very few female architects in the country and took over the project producing one of the most impressive works in the area. Another church in Eau Claire was eventually chosen as the Diocese Cathedral, however we are grateful recipients of glorious architecture that still retains it's beauty nearly two centuries later. We are located in the heart of downtown where we actively partner with the Salvation Army, Warming Center and other organizations joining together to make a difference in the lives our our neighbors and greater La Crosse Community. We actively partner with clergy and aid organizations in Kenya and Haiti, in addition to other international missions. Outreach, education and hospitality are all part of our mission within and beyond our congregation. We minister to our members and visitors alike. We bring Communion, blessings, anointing, guidance and counseling to members within our parish as well as those who can not travel to church due to age, illness, or disability. We are committed to our seniors, children and all those in between. The joy and beauty of our church and liturgy are central to our lives. Reaching out to others reinforces our spirit of communion within worship. We are a welcoming church whose members include a broad cross section of society. We are reminded of Urban Holmes's wonderful insight that when Anglicanism is at its best "its poetry, its music and its life can create a world of wonder in which it is very easy to fall in love with God." (What Is Anglicanism?, p.5). We remember that in its fullest attainment that love is both personal and shared. We are one of 21 parishes in North and Western Wisconsin in the Diocese of Eau Claire. We are members of the worldwide Anglican Communion, a part of the Episcopal Church in the United States of America who reside and worship in North and Western counties of Wisconsin.